Why Would a Skydiver Need a Guide Dog? To help him walk independently to the plane, of course! 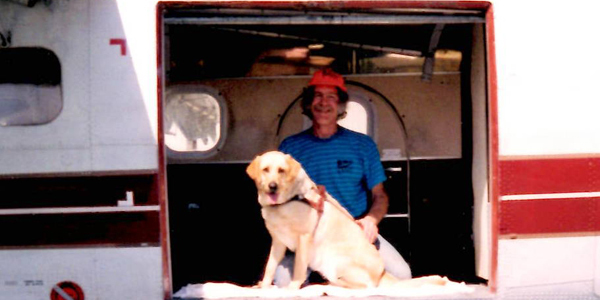 John and his guide dog, Kiowa. 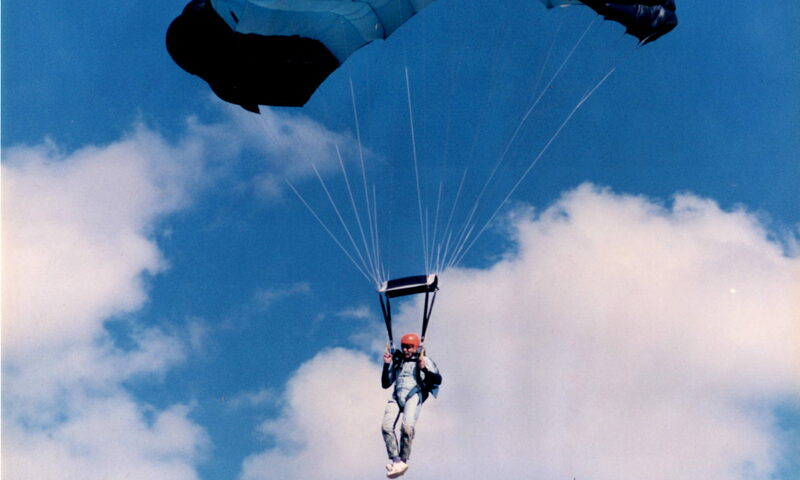 John and Kiowa were well known among skydivers. They loved playing practical jokes at the drop zones. 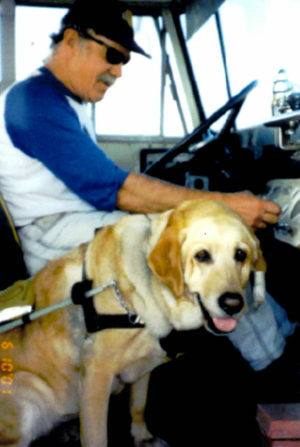 One of their favorite pranks was having a sighted person in the passenger seat of the van steering while John sat behind the wheel with Kiowa by his side. Imagine the newbies’ faces when they saw John pull up and get out of the van with his guide dog and cane. Based on Kiowa’s big smile in this picture, it looks like she enjoyed playing these games as much as John and his skydiving buddies did. She is fondly remembered at the drop zones. 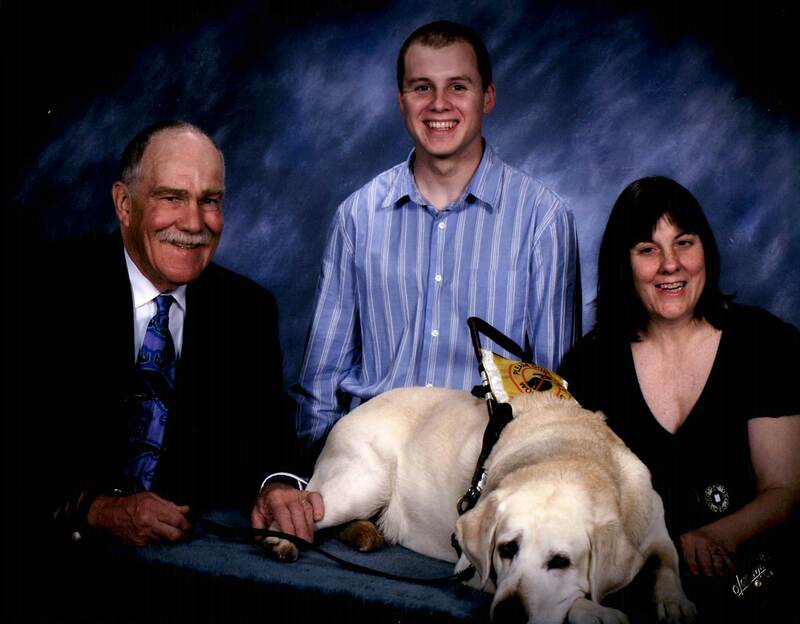 John was also known to get strangers’ attention by having his guide dog walk him and his cane up to the door of the plane. For those who didn’t know what a skilled skydiver John was, this caused some alarm! 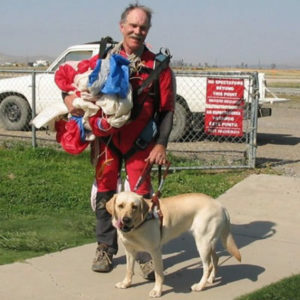 Here’s Tia, John’s last guide dog, helping John navigate Skydive Perris. Tia was a sweetheart who made friends wherever she went. Want to Hear More Hilarious Stories about Blind John? We have lots more, which we will include in the full-length documentary about John’s adventures skydiving while blind. But we can’t do that without your help. Please, give what you can to support our production costs at GoFundMe/BlindJohnMovie. My wife Kristy was happy and proud to take the above picture and “babysit” Tia while John was skydiving. Hey, Lee! Thanks for sharing and thanks to Kristy for the great pic and dogsitting. Previous PostPrevious What Does Retinitis Pigmentosa and Macular Degeneration Look Like? Next PostNext What’s Charles Bonnet Syndrome Got to Do With It?